On St Matthew Island in the Bering Sea, the US Coast Guard brought 29 reindeer to graze on the island's moss, to provide an emergency food source for men stationed there. Several years later the men left leaving the reindeer. The herd, grew too large for their natural moss food supply, ate it to destruction, and perished. Humans on earth are about to share that reindeer experience. We are consuming our supporting resources to exhaustion. We are too big for our ecological niche on Earth. We are consuming our renewing resources like clean water and soil to destruction. We are consuming fossil and uranium energy to exhaustion.(more). The solar and wind renewable energy sources won't be able to replace them (more)(more). And we are dispersing to the point of lost utility our non renewing supports like phosphorus, and rare earths. Barring some technological breakthrough, the earth, at the end of this century will support far fewer people. Our population, according to UN projections might rise to 9 or 10 billion persons by 2050 (more), after which, according to my calculations, might descend to 600 million who live like 17th century serfs(more). This decline, without extreme restrictions on births, will result from starvation or conflict deaths (more). Few want to believe my scenario. Most want to believe technology will make "tomorrow better than today." When previous civilizations overshot regional and technological limitations and collapsed, they rebuilt themselves better than before. People believe they and their children will slip through this century's bottleneck and be the survivors in the next even better civilization. My computations suggest only radical changes in human behavior resulting from a change in social organization can reduce overshoot to zero, avoid the tragedy, and implement an ever improving civilization. However, these changes appear too difficult to implement. Our genes are against them. Parts of our evolved brain are against them. Our culture is against them. Our institutions are against them. Most people see my proposed changes as expensive extravagances that obtain nothing of value -- specifically they see them avoiding no meaningful liabilities. most injuries I project for this century will not be avoided. implements a civilization that modulates what is considered normal, and approved, personal behavior. b) maintains these conditions thereafter. materials embedded in the infrastructure, and intellectual, manufacturing, and technology resources. unmoved in transition will have to remain because the new city/states, after other than hydro energy sources are unavailable, will not have have energy in their budgets to go get them. There is always a chance that technology can deliver more efficiency or a new energy source, e.g. liquid salt reactors, or fusion reactors. There is a chance that we could discover a whole new source, such as Star Trek's dilithium crystals or access to dark energy. However, if these do not come on line before 2100, when most of the deliveries of coal, oil, gas and uranium will be lost, we will be happy we contracted our footprint and did not suffer the harsh consequences of a scarcity/conflict driven die-off leading to an unrecoverable dark-age. This analysis, of a transition to 3 sustainable city states -- is based on the assumption that the weakest link in the chain holding up civilization is loss of energy deliveries. The other links will not break before the transition is complete. 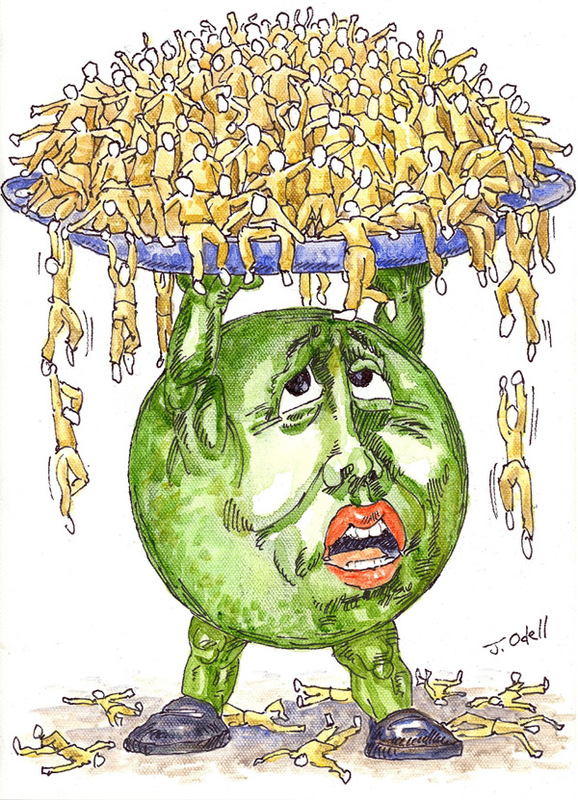 Climate disruption, biological collapse, social anarchy, will be defused by the rapid reductions in population culminating in world population near 50 million by 2100, and will remain manageable thereafter. One might ask why this transition must be accomplished before 2100? The answer is we need the energy provided by coal, oil, gas and uranium to make the transition. if we start the transition after these resources are in steep decline the transition may not be possible. Even the completion of population reduction to 50 million and reconfiguration of civilization into three carefully designed city states supported by hydroelectric power, is not enough to ensure sustainability during a 400 year interval. The proposed civilization must overcome two other unsustainable processes. 1) energy and resource diversion to non productive activities, like social conflict. 2) losing minerals and metals into an unrecoverable waste stream. Contractions, from our current civilization's design to the 3 city/state design, where implemented, because we were in overshoot of the earth's carrying capacity. Once human existence is just inside this carrying capacity, every kilogram of physical resource, every joule of energy is fully allocated. There is no allocation for the social conflict activity -- similar to the space station civilization, social conflict is a luxury these civilizations can not afford. The absence of social conflict is not just a social nicety, moral imperative, or a goal. It is an engineering necessity. Any consumption of resources in social conflict, not only makes the 50 million number smaller, (think giving up the violinists, the symphony, orthopedic surgeons, and knee replacements, it makes the entire design not sustainable. In addition, diverting resources to conflict, trips a causal loop called the scarcity conflict death spiral which collapses even a civilization operating below it niche's carrying capacity simply by diverting resources to conflict activities creating more scarcity and thus more conflict (see "How civilizations collapse?" Part 1 Part 2 and Part 3). Thus the new design must include successful inhibitors to social conflict. To identify these inhibitors, we must look at the mechanics that create social conflict. Konrad Lorenz suggested that conflict within a species is the natural result of drives to establish hierarchy and territorial rights. Embedded in our genes, these forces influence personal behavior, become part of a culture and eventually the basis of our institutions. Social evolution would suggest that the best of these gene expressions create the best civilization. In a Darwinian sense the best designs survive. However, today, the best civilizations seem destine to destroy themselves and another will not be able to birth itself from the ashes. So Darwin's predictions may pick survivors with in a species in a slowly changing environments, but in the dynamics of our present world, a species actions can eliminate itself. Humans can raise the CO2 levels, and temperatures and sea levels and sea acidity, eliminating themselves. So much for sapience. Humans are unknowingly planning their demise? We are consciously killing ourselves off because we think we are on a good path forward. Maybe there is some other use of sapience. Maybe sapience can devise controls over the internal forces that choose against us. Why do we have social contracts? Why did we add suffrage and abolition to the social contract? What do we have to add to the social contract to obtain sustainability? social organization lets its individuals live better than they would living separately. That is cobblers, blacksmiths, farmers, herders, millers, live better than each doing all these tasks for themselves. The conjoint (civilization) is a more productive path than each living like hermits or single families. Fittest for civilization is defined as a larger amount of cumulative goods distributed acceptably among its members. Maximizing cumulative goods is not completely different than maximizing the propagation of ones personal genes because the cumulative goods advantage is also an individual gene advantage. It also follows that forces of maximizing gene expression is only counter productive when it t reduces cumulative goods. Or worst case, it degrades earthly supports so they cannot support even the before civilization population. With the Civilization pushes hierarchy and territorial rights of the individual behavior to groups. Unfortunately it is very hard from them to compete without diminishing their accumulated good. So not only did the cobbler have to give up his rights to win by force or get his choice of brides, his civilization has to do the same. Failure to reign in these risky behaviors threatens the elevations of good for both sides. Especially in resource constrained environments such as the space station or the earth. Conflict, instead of determining the fittest actually chooses extermination. Conflict decreases both physical and human capital. The physical things that man built to make his life easier are destroyed. The people killed actually means a loss of productive capacity. It means the civilizations investment in making them productive is lost. Destroyed Infrastructure must be rebuilt at an additional expense just to return civilization to a place where it had already been. Energy diverted to the conflict activity plus the energy to rebuild infrastructure and human capital is wasted and cannot be used to advance the civilization. Let me skip the part of the solution where we figure out how to rewire these genes. That might come in the future but right now there probably isn't time to help us complete the transition in the next 85 years. Changing the genetic make up of everyone's DNA has the same probability as finding dilithium crystals. Instead I will conceptualize changes in culture that might contain these forces. That is I will consider what cultural influences are strong enough to force each individual's behavior to collectively allow a containment of conflict. Since the feedback loop is triggered either by increasing conflict or increasing scarcity we might address both. Let me focus on limiting or decreasing the forces or processes that create scarcity. Scarcity increases for two reasons. 1) scarcity is created by declining system deliveries. for example, the emptying of reservoirs or the mining of ever lower grade ore. Both of which are eliminated in the above design. 2) one group disenfranchises another from its supporting resources. This section will discuss the proposed mechanisms for preventing the second kind of increasing scarcity. Even if the rich do not disenfranchise the poor, the poor can feel they don't have a fair portion. This is structurally addressed by redefining the commons to give everyone living an equal portion. One group disenfranchises a second from a share of the commons produced wellbeing. And relying on an energy budget that delivers. are created to large extent by limitations on scarcity. Scarcity produces people who are willing to consume resources to acquire resources controlled by other people and assigned to other purposes in the civilization. People who are using these resources for these purposes, then cause more the people who are protecting their control over resources to divert more resource from support to conflict. The net effect is an unending increase in diverted resources and an unending decrease in supporting resources. The increasing scarcity grantees downward spiral in the quality of the civilization. The only way for this loop to not be tripped is to make sure no individual feels so much scarcity they are willing to damage the system to get a bigger share of it. There are several ways to prevent this conflict-producing-scarcity. b) equal ownership of a greatly expanded definition of the commons. c) manage access to resource use which maintains the commons assets. continuous access to non renewables is created by including a means for mass accounting for the non renewables with in the system after the energy of recycling exceeds the energy to mine lower grade ores. Since the present civilization has such a large percentage of its 7 billion persons in hardship, and this means endless and ever increasing conflict which means civilization collapses which means loss in production. One description of sustainable, is a combination of a much smaller population probably near 50 million global, with enough limits on equity to limit conflict, recycling instead of mining. All this supported in balance with the deliverables of earth that lets the rest of the eco system run its natural course without interference. Without some technological breakthroughs, even this drastically different design for a civilization might remain sustainable only 3 centuries (e.g. 2100 and 2400) if transition to it happens in the next 85 years. This finite interval for transition, this finite interval for longevity adds some additional parameters to the design. Now why did I pick an 85 year transition period to sustainable. why did I pick this interval for longevity as the three hundred years between 2100 and 2400?. a) It is the time period after fossil or Uranium fuels produce net energy. That is, it will take more energy to acquire this energy than it produces. over the planned 300 year interval. Add to this protection from inequity, and few resources with be squandered in conflict. The result is a A Sustainable Civilization. I picked a design that does not depend on new technology. We may not be able to bring fission, or even liquid salt thorium reactors on line before 2100. And if we could, it is not at all clear that we could bring them on-line at the rate fossil fuel support declines, It is not clear that it might take so much energy to bring them on line there would not be enough to both support us and build out the infrastructure to transition to them. I picked a civilization design which supports a high enough level of technological progress, to provide a chance for developing and bringing on line a new energy source by 2400. The design allows us to educate these scientists, fund their labs, pay their salaries and free them from the time consuming tasks of growing their own food and providing their shelter. Certainly if we allow civilization to collapse advancement in technology will be impossible. By 2400, we may lose hydro dams from siltation. Alternatively by 2400, the high level of technological advancement might provide a chance to invent and install an efficient energy storage system that would let stream flow (the flow energy that remains after reservoir silt in) to produce civilization supporting energy and thus extend the sustainable interval beyond 2400. However, this may not be true because some dams in the US are so far from a central grind, and require such long road or rail maintenance that they might have too much overhead to maintain them. So we can use power from only part of the dams presently in use. On the other hand there are dams in Canada that serve Canadians who are not accounted for in the Lawrence Livermore figure. If these dams are included in the grid the population, at (96,000 KWH per year per person the number increases. There is an additional benefit of electric transport. The efficiency BTU per ton mile his higher for electric motors than internal combustion engines. All the energy that goes into the subway eventual is reduced to waste heat which is higher than ambient temperature so this transport can be used to heat habitats. But this assumes you will be burning fossil fuel in internal combustion engines with 60% lose of starting energy in heat Only slightly better in jet engines used in planes. Given that we are using hydro not fossil fuel there are some efficiency gains. so the actual number is probably closer to 50,000 KWH per person per year. a) if fusion or thorium reactors do not come on line. 3) While the figure suggests that we will have 2.54 quads of hydro power, which gives a population of after initial calculations some of the dams like Tennessee river valley may be too expense from an energy standpoint to maintain. That is too much rail and transmission lines are needed to support them so the net energy from them is too low. On the other hand if we connect in Quebec Hydro and transmit it to some location in the Pacific North west and we add in the efficiencies we can support about 10 million people in the design. These are very rough approximations but its a place to start to make the other calculations that make up a sustainable society. 1) the base level of wellbeing, which I think should include. 3) restraints on energy density dilution. c) non renewables conserved by lease and recycling up front fees. 7) equal energy ownership of hydro-power production. a transition to and maintenance of this non injury civilization. The human experiment has a bit of an emergency. It has used fossil fuel, and natural capital (soil, air, oceans, water, flora and fauna) to greatly expand human numbers and consumption. Everyone strives for higher wellbeing. However, wellbeing successes have resulted in greater disparity and disenfranchisement. Resulting in diversions if existing resources to conflict and additional injury to people and the environment. These supporting resources may contract as much as 95% in the next 85 years. Rather than expect a large die-off and civilization collapse, humans expect technology to replace exhausted supports with new ones. These expectations have low probability. The higher probability scenario is that most of human civilization will not be supported. While I have presented the target civilization and forces that would maintain it. I have not described the behaviors/forces that will help humankind make the transition to this new civilization during the interval where historic supporting resources are contracting. a) there will be sever injury to individuals and the environment in the best of these transition designs We have grown too big and the supporting resources will be contracting too swiftly. b) because of the second law of thermodynamics, even this new civilization design will support itself for only 400 years. To get it to go farther our technology has to advance and produce energy supports beyond those that we now know. c) The forces (to be created by new behavior) is far different from today's norm. In today's terms they are unthinkable like changing the rules of chess in the middle of the game. While earth will receive sunlight for billions of years, the above design, (being powered by existing hydro electric dams) has a life of about 4 centuries. By which time the dams would silt in and not be able to produce a continuous supply of energy. Instead the dams will supply a seasonal supply of energy related to stream flow. The time limit might be extended though the invention of an energy storage system and increased efficiency of energy use. That is if these new technologies can be discovered, developed, and implemented during the next four centuries. It also depends on civilization remaining robust enough to advance technology. 7) non inhabitance of wilderness areas -- for recreational use only. recruiting new members for the constituency that will vote for the new social contract. These deliveries are called the carrying capacity. prevent diverting resources to social conflict. 1) We are already in overshoot of natural carrying capacities because there is no room for other species for example polar bears and microbes; destroying soil through over planting, changing the weather or poisoning the environment with our wastes; and running out of places to live, grow food, and obtain water. a) we are increasing the amount of resources diverted to creating or addressing conflict. b) non renewables are being exhausted. This diversion of resources to conflict stems from increasing scarcity; which happens naturally when all individuals attempt to increase their consumption. Or it happens when some individuals increase their consumption creating inequity. Either way, scarcity forms a feedback loop with conflict. Normal behavior triggers the loop. More scarcity more conflict more scarcity etc. equals more overshoot. 3) Today's carrying capacity is defined by access to fossil and uranium reservoirs which are emptying. For example: the sunlight collected and concentrated over millions of years in the crust as well as concentrations of Uranium and other minerals and metals, will be mostly unobtainable by the end of this century. Their deliveries will probably be reduced by half by mid century. 4) Our hopes for substituting renewable energy sources for energy lost when the reservoirs are empty are misplaced. The planet's supply of sunlight, while abundant and constant, requires so much energy to collect, consolidate and deliver in a useful form, the net energy cannot run (at present technology) a modern civilization. Thus: solar thermal, solar photo voltaic, wind turbines, and after 400 years hydro electric dams cannot support us. Neither can geo-thermal, wave, and tidal flow energy sources. By some calculations, today's operating hydro can produce enough net energy in limited locations of special design, can for 400 years support 50 million person each consuming on average 96,000 kwh per year. And this projection assumes no energy is wasted in social conflict. 1) contracts the human footprint faster than our diminishing carrying capacity. precluding the need to mine ever lower grade ores. 96,000 kwh per person per year. humans leave 98% of the land area in its natural state. Population is defined as 50 million global. the commons now includes all mass and environmental processes. little role in inhibiting the number of children each has. Improve the arts and sciences and wellbeing from the best conditions today. restrictions on individuals and the state to impact individuals. above those achieved by anarchic behaviors. For example, economies of scale, specialization of labor, and enhanced trade. Hermits move to live in civilizations by choice to gain the available benefits. People today move to cities from the countryside to improve there lives. In simplest terms, it better to let a cobbler make shoes and safely, under the protection of civilization, trade them for food than be a hermit which has to both grow food, and make shoes in isolation. Moving together, from places of isolation, means the behaviors of one person more often or to a greater extent affect the living conditions of another. One refinement on a haphazardly formed civilization, for example kinship, tribes, royal kingdoms, feudal societies, autocracies and democracies is the social contract. The two independent actors see that by abiding the social contract conflict does not waste resources. The social contract can be expanded temporally, so that the benefits and constraints reflect benefits of present behavior (or restraints on that behavior) reflect the liabilities or benefits as they accrue to everyone on time line. The social contract can also be expanded through widening beneficiaries. For example the flora and fauna of the ecosystem, or the balances of non organic elements like the nitrogen cycle, or fossil reservoirs or ozone products like fluorocarbons carbons. Or parts of the system like ozone layers and what standing they should have assigned in a social contract. To attain these civilization attributives requires changes in the social contract. 1) civil control over annual number of births per year. 3) civil control of use and recycling of non renewables. 4) civil control of the separation between the rich and poor. There is a way to transition to this civilization design, and maintain it for the next 4 centuries. but it costs, At what costs would these conditions be worth avoiding? They have to be cognizant of the injuries that transpire every day. They have to understand what injuries will unfold on our present course. They have to have an understanding of the injuries that will play out even in the best of transitions. The have to believe that after the transition is complete, a balance will be established, where humans use only what the environment can supply without being diverted from its natural course; the course before humans became the plague species. They have to believe the design allows non-human species to re-establish their natural equilibriums as if humans were not present. The design does not require the present energy sources that will not be delivered after this century. The design does not depend on mining ever lower grade ores. The design does not require new technology. In addition the design inhibits the inequity among humans enough to prevent diversion of supporting resources to conflict. The design can be reached by 2100 and then exist in harmony with the remaining environment for three or more centuries. After three centuries of high technology development either that new energy technology will be developed or human materialism will be down sized orders of magnitude. So in absolute terms, this new civilization is only a bridge to a yet newer civilization 4 centuries hence. A civilization run on new technology, material, and energy. nothing lasts for ever so the time duration is 400 years. Think about the way you want to live. With or without health care. ( for example with or without a polio small pox vaccination. do you want to live with or with out education. With or without hot water showers, or the internet, or glass windows, or sewage plumbing, or eye glasses, or a dentist, home heating, or running water, or a job better than digging weeds out of a garden. For a long time I have worked to get the contributions to behavior of cognitive abilities to dominate baser instincts. However, I have come to the conclusion this will take too long, we will collapse long before everyones cognitive abilities naturally produces value for sustainability of human wellbeing. So most recently, I have created a design for saving both humankind and eco system, that uses the cognitive abilities people have today, to create a constituency, that coerces the needed behavior to unwind the predicament This the same model that used to implement abolition and suffrage. A constituency forced institutions to write laws that coerced the desired behavior from everyone. This path to change removed the hand ringing resulting from personal behaviors that ran counter culture or more basically genes. f) does not support itself with resources whose supply will diminish over time. The motivations for joining this new constituency are varied. Help them see why that injury will not be prevented with many paths forward. a) Some will understand the complexities that connect universal behavior "A" with future collective condition "B"
b) some will understand only part of this complexity but it will be enough to make them join. 2) a cheap non carbon based energy source replaces exiting energy sources 100 times over. grow food in underground caverns with artificial light. Leaving most of the land area on earth as natural as it was before hunter and gatherers. 1) a worm hole that we march the poorest 7 billion people into it. They don't just pop out on a new wonderful planet empty of humans. Leaving our depopulated earth to support the remaining 100 million humans..
That is millions of behaviors that now seem counter to our culture and genetic bias become modulated though a new civil structure. what to change to prevent reimplementation. The human burden on the earth has grown so large a crash threatens to destroy individuals, the environment, the infrastructure, and social organization. Normal human behavior, which in the past promoted not only survival but improvements, today promotes destruction and extinction. Each visitor to the space station requires the better part of a billion dollars. Each delivered gram of energy and mass has a specified use. Should any energy or mass be consumed in conflict, some other activity could not transpire. Similarly, in a sustainable civilization on earth, every unit of energy and every gram of mass is already assigned. Should any of them be diverted to social conflict some part of the sustainable design could not be implemented. Social conflict prevents implementation of the civilization-transition program, designed to sneak through the bottleneck we have created with human overshoot. Beyond 4 centuries, if no new technology came on line, seasonal variations in stream flow will vary hydro power and if the result is less energy delivered further reductions in population or per capita consumption will be required. However if the civilization produced new sources of energy or more efficient ways of using it, This bridge civilization would successfully complete its purpose and the new civilization would allow a healthy and prosperous civilization to continue beyond 4 centuries. The way we have been living was never sustainable. It was based on millions of years of stored solar energy. It relied on water that took millions of years to collect in aquifers. It depended on mineral and biotic rich soils that were made over millions of years and moved around by glaciers. It depended on concentrations of minerals and metals in the crust. However, soon the delivery of goods and services that support us today will greatly diminish. The definition of sustainability is not relative to today's deliveries. Sustainability is related to deliveries that are expected to exist in the future. Over millions of years has converted to reservoirs of fossil fuels. The conversion rate is much slow than our use rate so we are emptying those reservoir We are mining minerals and metals in the crust with the richest veins first and the poorest veins last. And eventually it will take too much energy to extract them. Its a good thing we can recycle some of them like copper. Growing our food mines our soil of minerals, but these minerals also come from mining and require energy so the current agricultural process will not last for ever. Environment provides services like purification our water. Overtime we have made this earth habitat support an ever growing number of us now 7.2 Billion. Not all equally but that will be dealt with later. How could that be. The sun is going to shine and it delivers to earth each year 1000's of times more energy than our civilization uses. There is wind and tides and Geo thermal energy to harvest. However, we forget that it takes energy and labor and materials from the earth's crust to harvest this energy and make it usable to do work. And with a few calculations it is easy to see that after this energy and labor is expended, there is not enough left over to keep the present civilization going. So what is this cognitive process? I used to think it was upgrading the learning environment so that each person's cognitive processes could see, from a models of reality standpoint, certain behaviors lead to a nice future and others lead to a bad one. While previous cognitive processes chose behavior that was tempo and loco centric. The values we benefits me and now and not my kids in the future. for 30 years I worked on fix that bug in the cognitive make up. Cognition at the individual level either dominated genes and resulting culture or nothing would change -- we were going to get the black future. So worked not at changing the cognitive abilities of infants rather than adults. The research was fruitful at the theory level, but from an engineering level, the solution would take so long for its implementation all of the collapse events would take place before behavior resulting from cognition dominated genes could take effect. When the alien archaeologist picks through the remains of a completely decimated earth they will see that we had a view of where we were going. And somehow we could not convert this view of disaster into a change in course. This time avoidance requires the upper brain to control its lower brain and the genes below that. Cognitive process may be our only way forward, unless we are willing to accept an autocratic authority culling the population and controlling every person's person behavior. 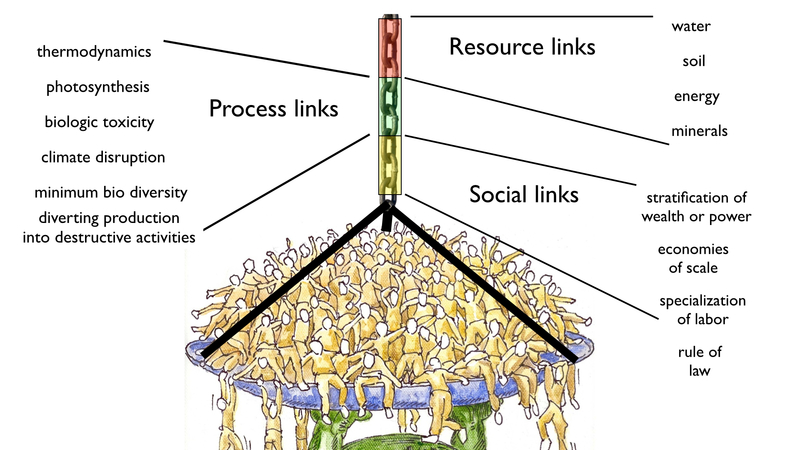 social supports were robust beyond the local needs, (a few could always downsize and live like hermits in the abundant woods, today, when outcomes include the utter exhaustion or destruction of the supporting environment (no woods) and the loss of benefits that were hyper expanded because of complex structure of civilization, for example where most of the 7billion are supported on food they did not grow, then in collapse the fittest for our civilization, are now just food for the cannibals among us and that food supply is temporary. The resistance to change includes: people do not want to down size and be hermits - they would rather eat someone else's lunch. They don't have the skills or space to do it if they were willing. If per chance a small group prudently set up a self-contained somewhat isolated support system (food,housing, etc.,) a retreat, its viability is near zero given the onslaught of hungry billions who will be foraging like locus, eating everything they find including people. Also added to this already deadly stew of disruptions to social and environmental supports are the effects of social conflict. Social conflict triggered by scarcity, consumes resources creating scarcity. The feedback loop triggers a downward trending supports from which there is little chance of recovery. The behaviors selected by our brains and approved by our culture no longer meet the criteria of survival. Natural selection is now a terminal process for our species and maybe life on earth. , that can be implemented by the existing generation that can overcome these forces created by this stew and set a course that not only avoids the worst tragedy but sustains itself. Even allows for the continued advancement of the arts and sciences. was sufficient when when we depended only on renewing resources. It was sufficient when specialization of labor, economies of scale, and trade produce a surplus. This worked when stored fossil energy supported us. However, fossil energy will soon be exhausted, a crash of civilization could remove its benefits. We might have no chance of supporting seven billion people. We might be lucky to support half a billion and then only as subsistence farmers. The time frame of this transition is this century. The transition could be difficult and a much smaller group with a much smaller global foot print could continue in a non ruined environment with our art and science intact. Or tragic with most of the global population starving to death or dying in conflict and the survivors living at subsistence in a mostly ruined environment. social conflict does not erupt at a label that diverts resources from support. a) if the infrastructure breaks, we use supplies and energy to fix it. we lose the delivery of those resources. c) When you exhaust a supply you have to substitute or lose service. e) if there are not enough deliveries to do everything, some activities are discontinued. This is not a complete list but it allows the creation of the initial sustainable design.